[Episcopal News Service] One of the biggest developments at the 79th General Convention related to the Episcopal Church’s work on racial reconciliation was the approval of a new grant program to support grassroots efforts, building on the progress made under the church’s new Becoming Beloved Community framework. The grant program outlined in Resolution D002 marks the first time the church will provide direct financial support for Episcopalians working toward racial healing and justice in their congregations and communities. The 2019-2021 church budget includes $750,000 for the grants, much less than the $5 million recommended by D002, but these initiatives – such as forums, workshops and informal gatherings – often don’t need a lot of money to become viable and thrive. The church also is taking steps to bring those people together to share their insights. Another resolution, A228, calls for the creation of a Becoming Beloved Community summit by the end of 2019 to support and inspire the leaders of such initiatives. The resolution references the church’s aspiration to create “a network of healers, justice makers, and reconcilers” who would benefit from the pool of knowledge and shared experiences. Church leaders and staff members point to the model of the Episcopal Church’s church planting network, through which the creators of new ministries receive grant money and learn from fellow church planters. “That’s when grants make a huge difference in the church, and that’s what we now have the opportunity to build around Beloved Community,” said the Rev. Stephanie Spellers, the presiding bishop’s canon for evangelism, reconciliation and creation care. General Convention in 2015 identified racial reconciliation as one of the church’s three top priorities, along with evangelism and creation care, acknowledging the church’s decades-old efforts to confront its historic complicity in the sin of racism during the eras of slavery and segregation. The labyrinth diagram showing the four parts of the Episcopal Church’s Becoming Beloved Community is colored for an Advent mailing. Becoming Beloved Community is a framework that launched just last year. 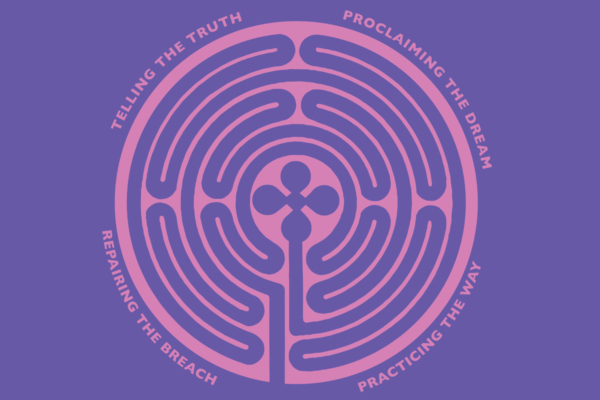 It is broken into four parts that are illustrated as a labyrinth: telling the truth about our churches and race, proclaiming the dream of Beloved Community, practicing the way of love in the pattern of Jesus and repairing the breach in society. Because Becoming Beloved Community launched in the middle of the triennium, about $1 million was left from the money budgeted for implementation in 2016-18. When the 79th General Convention met last month in Austin, Texas, it approved a new budget that applies that unused amount to continued implementation in the new triennium. A total of $10.4 million was OK’d for racial justice and reconciliation work over the next three years. That amount includes a range of expenses, from anti-poverty initiatives to ethnic ministries, as well as Becoming Beloved Community and the new grant program. The grant program was assigned to Executive Council for development and implementation. Executive Council meets next in October. The local focus of the grants will be critical, said the Rev. Edwin Johnson, a deputy from Massachusetts and chair of General Convention’s Racial Justice and Reconciliation Committee. Johnson points to the experience of his own congregation, which is largely Afro-Caribbean. He received a Mission Enterprise Zone grant to start a Spanish-language ministry there, and it has thrived with support from the network of Episcopal church planters. Johnson is active in the development of a similar network of racial reconciliation leaders. About 50 people testified before Johnson’s committee at General Convention about the various resolutions assigned to the committee, and afterward, he reached out to each of them to enlist them in a new community of action around racial healing. Catherine Meeks, one of the pre-eminent leaders in the church’s longtime push for racial justice, echoed Johnson in emphasizing the role of congregations. Meeks’ work in developing and conducting anti-racism training for the Diocese of Atlanta has served as a model churchwide for such training, which was mandated for ordained and lay leaders by a 2000 resolution passed by General Convention. Implementation has been uneven. “It’s a mandate that nobody really enforces,” she said, and dioceses’ track record of implementing plans for the training continues to be a topic regularly taken up by General Convention. Last month, General Convention passed Resolution A044 attempting to clarify the criteria for such training, suggesting a structure that coincides with the four parts of Becoming Beloved Community. Another resolution, A045, acknowledges “not all dioceses have followed the spirit of the anti-racism training required,” and it calls for better documentation of participation in the training. The training is vital, Meeks said, because it provides a safe setting for Episcopalians to confront tough questions about their church and themselves while helping them open their minds and consider ways they engage in racial healing and justice. Meeks now serves as executive director of the Absalom Jones Center for Racial Healing, a ministry of the Diocese of Atlanta that offers a churchwide resource for fostering open dialogue about race and racism. At the same time, Meeks led a push this year to move away from the term “anti-racism” in favor of a greater focus on healing, justice and reconciliation. She helped Atlanta Bishop Robert Wright and others draft Resolution B004, which sought that shift in language. “To talk about our work under the rubric of healing and justice and reconciliation just has a more positive energy around it and states what we’re trying to do in the world,” Meeks said. “What pleased me the most was the conversation we had around the issue, because I think that conversation was very healthy and very needed,” Meeks said. Many people feel strongly about these issues, whether affirming the need to maintain a focus on dismantling racism or pushing for a more theological approach to racial healing, said Kim, the staff officer for reconciliation. The value of the Becoming Beloved Community framework, she said, is that it seeks to engage all Episcopalians in that conversation, wherever they may be on their spiritual journey. “We all have room to grow in terms of how we can be reconcilers and healers,” she said.